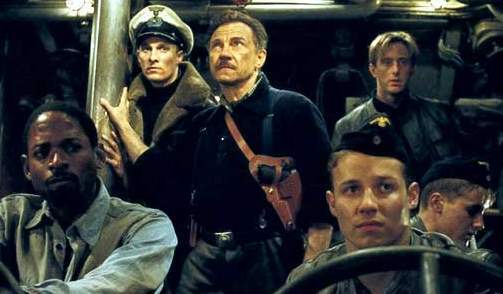 On the surface, the submarine yarn "U-571" calls to mind a number of similar films, such as "Crimson Tide", "The Hunt for Red October", and the film that most closely resembles, "Das Boot". However, upon closer inspection, it is clear that this latest entry into the genre lacks the moral complexity or depth of characterization found in the aforementioned films, as director Jonathan Mostow ("Breakdown") has chosen to invest his efforts into upping the ante on the action sequences to create a white-knuckle roller-coaster ride. Having more in common with "Speed" than "Saving Private Ryan", "U-571" is certainly not a meditative or deep examination of the inhumanity of war, yet it still manages to satisfy with a powerful combination of thrills and chills. The year is 1942, and the Allied war effort is under strain with Hitler's U-boats which are disrupting supply lines between the United States and Britain. In the icy seas of the North Atlantic, a German U-571 is severely damaged by depth charges after a run-in with an Allied destroyer. Unable to make the long trip back to homeport without assistance, the ship's captain uses an Enigma decoding machine (which resembles a typewriter) to send a coded message to German naval command. However, the message is intercepted by the Allied naval intelligence, who devise a daring plan to reach the crippled sub first in order to steal the Enigma machine-- a move which would go a long way in thwarting Hitler's war machine. A mission is quickly thrown together, which involves disguising a United States vessel, an S-33, as a German re-supply sub. On board for the mission are Lt. Commander Mike Dahlgren (Bill Paxton of "A Simple Plan"), his ambitious executive officer Lt. Andrew Tyler (Matthew McConaughey of "EdTV"), level-headed veteran officer Chief Kough (Harvey Keitel of "Three Seasons"), hot-headed communications expert Lt. Peter Emmett (singer Jon Bon Jovi), German-speaking radio operator Wentz (Jack Noseworthy of "Breakdown"), and ship's cook Eddie (Terrance Carson of "Gang Related"). Also along for the ride are two heavy-hitters from naval intelligence who will run the show, German-speaking Lt. Hirsch (Jake Weber of "Meet Joe Black") and Marine Major Coonan (David Keith). Naturally, complications quickly set in after the disguised S-33 puts out to sea. Though a small team is able to overpower the crew of the U-571 and secure the Enigma machine, their hopes of a quick escape are dashed when their ride home is scuttled by a German torpedo. Caught in the targeting sights of an enemy submarine, Tyler and his fellow seaman use the only means of escape left to them, the German vessel that they have captured. Having to contend with the German-labeled controls of a crippled submarine, while navigating through heavily-trafficked enemy waters, it will take miracle for Tyler and his makeshift crew to make it back to friendly seas, let alone survive. After a slow start, "U-571" kicks into high gear as a crowd-pleasing actioner when the story focuses on the frantic struggle for survival aboard a foreign submarine. Helped by some impressively crisp sound and visual effects, the film conveys the claustrophobic sense of urgency of the story-- this is one film that should be seen in a state-of-the-art theater. For filmgoers purely out for visceral thrills, "U-571" offers a terrific selection of edge-of-your-seat sequences, including a guns-a-blazing hostile takeover of the U-571, the initial disorientation of Tyler and his crew when they first try to pilot the crippled vessel, an undersea cat-and-mouse game against an enemy submarine, and a tense stand-off with a German destroyer. Like "Speed", the complications and reversals are relentless with their untimely arrivals, creating a very grim and suspenseful atmosphere. However, with that said, other than pure adrenaline and fear, there is not much else to "U-571". Populated by barely sketched out archetypal characters, such as Keitel's ever-loyal sidekick and Jovi's emotional skeptic, there really aren't very many engaging characters in this film. Furthermore, most of the dialogue is purely functional 'technobabble', as the characters run around and bark phrases at each other such as "Splashes!" or "Blow the ballast tanks!" In fact, the film's only emotional beat, character-wise, is Tyler, who has recently been turned down for command of his own vessel because his commanding officer, Dahlgren, believes that he is still unable to make the truly tough choices as a captain-- who lives and who dies. Of course, as the story develops, Tyler ends up assuming command of the enemy sub, and finds himself confronted with the very type of choices that cost him his own command-- who will he leave behind, and who must he sacrifice to survive? Thankfully, this works with McConnaughey playing this character with raw determination and poise, which is a far cry from his usual easy-going Southern hospitality demeanor. It doesn't sound like much, but it does inject some much-needed emotion into an otherwise pure 'hardware' film. Another limitation in the story is that the opposing sides of the conflict in the story are also pretty clearly delineated. The Allied characters are all good, while the Germans are wholeheartedly evil, and there is no middle ground to be found, which excuses the film from delving into the morality of one's actions in war. 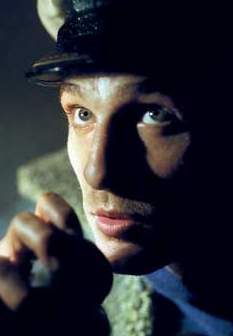 As an example, "Das Boot" had a terrific scene where after having sunk an enemy ship, the captain is torn emotionally when he must leave the survivors to drown, since there is no room for him to take on prisoners. Contrast this to "U-571" where the captain of the German sub has no reservations when he orders his men to machine-gun a lifeboat full of British sailors. This, of course, prevents audience sympathies from being divided between the two opposing sides, since the Allied way is the only 'right' way. Despite being saddled with a shallow script, "U-571" still manages to satisfy on a purely visceral level, and will certainly make for a thrilling night at the movies. Like his previous effort "Breakdown", Jonathan Mostow's latest actioner is a heart-pumping thrill ride that will easily win over audiences with its machine-gun pacing, special effects, and suspense-laden story.